Character development is consistent – Squirrel Girl in issue #11 acts on one key character development thread set up in past issues – Squirrel Girl’s Computer Science studies. Using her intelligence and experience, she outwits several Marvel villains. Squirrel Girl is studying computer science, and it’s a great direction for the character. I just re-read issue #11, where Squirrel girl uses her new knowledge, adapting to a touch encounter with Doctor Octopus. She notices some examples of Computer Science, and then takes the villain down. The villains of the story are well selected – they appear to have a size or power advantage over the protagonist, but the storytelling shows the readers how the main character overcomes these challenges with their skill sets. Later, Squirrel Girl uses more Computer Science to distract Count Nefaria. Binary hand signs are a way that you can represent zeroes and ones with just your hand. Anything that has an on and off state, and can switch between these two states, can represent digits in binary. All fingers up is 11111, and all fingers down is then 00000. Then you assign a number to each finger and thumb – with 1, 2, 4, 8, and 16 with the pinkie as one, moving from each finger til the thumb is 16. Notice that the numbers are doubling each time. Count Nefaria loves these binary hand signs. Squirrel Girl later makes use of these hand signs to defeat another villain from Spider-man’s rogues gallery – Venom. As many people know, having seen the movie Spider-man 3, Venom is weak to sound waves at high frequencies. Using the loud sound waves generated by a pack of Central Park Squirrels, Venom could be taken down. Except the brave woodland army can’t hear Squirrel Girl’s commands. This is where the Binary hand signs come in. Squirrel Girl directs her army at Venom using Binary digits to indicate directions of attack – 12 o’clock, 6 o’clock – until the savage symbiote dissolves. It’s a very impressive issue. Squirrel Girl defeats her enemies by persuading and outwitting them in battles of wits. She uses minimal violence, and there is a strong sense of honesty. The setting is well selected for the subject matter – a battle of wits in a dreamscape. Comic scripts need to have a good setting, and a dream setting, within limits, gives an artist freedom. Squirrel Girl dreams in this comic, and has a nightmare about arriving in an exam, in a course she did not enrol in, unprepared and stressed. She runs through how she is going to confront the irrational fear, and then takes action. In this case, going to the Dean, and explaining there has been an error. It’s a decent example of finding something that frightens you as a writer, and exploring it with a character. Character arcs in the comic tie into their backstory, and their skill set. Squirrel Girl’s logical computer science knowledge contrasts with Nightmare’s abstract dreamscape powers. The computer science is woven effectively into the comic script. She fights a dream monster – the Marvel villain Nightmare – by using the logic of Computer Science, which is the antithesis of the illogical and abstract dream world. This is solid storytelling. In this way, the comic is also a nice example of science communications. If readers are interested, they can pursue some of the basic concepts explored here later. If there ever is a Squirrel Girl movie (hopefully starring Anna Kendrick), this issue might make a great plot point to build from. The return of survivors from the Marvel Universe, and key character moments for Doctor Strange and Reed Richards. Questions and ideas on gods and humans. A truly shocking moment in the artwork for this issue of Secret Wars is Doctor Doom revealing his face to Susan Storm. The pane depicts Doctor Doom staring directly out at the reader. 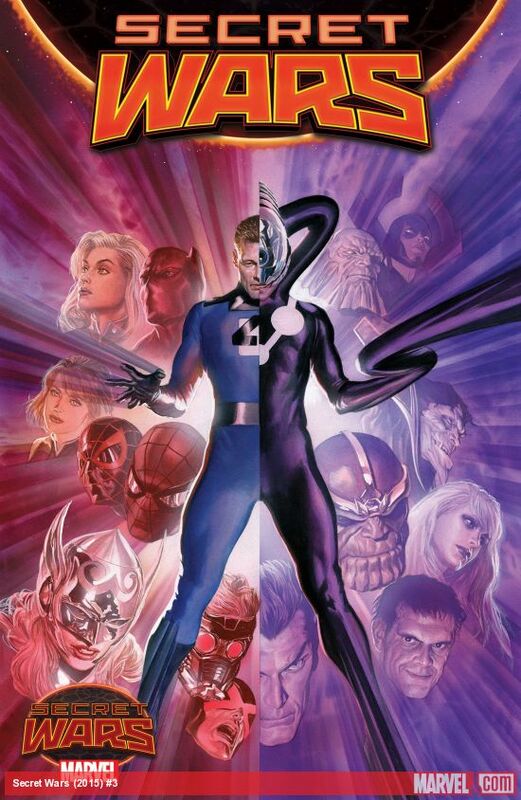 We see the scene from Susan Storm’s point of view for the moment he unmasks. It makes the reveal feel disturbingly close. Without comment on what exactly is show to avoid spoilers, the way this scene plays out does shock. Backtracking to earlier in the comic, Doctor Strange and Doctor Doom wander through a tranquil, walled garden inside Dooms kingdom at the centre of the Battle World patchwork of worlds. The scene gives an insight into Doctor Doom – he keeps a calm place at the centre of his world, but there is an unusual and unsettling statue that stands out, and is the focal point of these opening scenes. The survivors of the Marvel Universe return, and listen to Doctor Strange’s explanation about Battleword. Reed Richards of the Fantastic Four is distraught, but Doctor Strange confirms that Doom is an able leader at the end of everything. Significant plot changes are not brought on by action in Secret Wars #3. The plot pace slows, and beings to muddle along. The information Doctor Strange gives readers about the state of the Marvel Universe, delivered through a question and answer session with other Marvel Universe survivors, enlightens and clarifies what happened. Action is missing. Instead, there are scenes explaining what happened to start Secret Wars, and why Battleworld exists. Listening to his explanation are several heroes from the Marvel Universe missing since the multiverse finally collapsed. Captain Marvel, Miles Morales and Peter Parker, and Scott Summers are surprised at the changes brought on by Doctor Doom and Doctor Strange. They saved the lives of millions of people, and Doctor Strange points out that Doom is an effective leader. At the same time, Doctor Doom speaks with The Invisible Woman Susan Storm, saying how he feels he is an uninspiring leader. They talk at length about Doom’s ascent to becoming a god. Is Doctor Doom worthy? Mr. Fantastic, Reed Richards, is distraught to hear that Doctor Doom governs over a patchwork version of all reality. Even more shocking – the two Doctors assembled this world over the course of 8 years. In that time, they found the multiverse survivors, but kept them hidden and in suspended animation for 3 out of those 8 years. The comic delves into questions about humans versus gods: are gods that different from humans in terms of motivations, thoughts, and wants? A question appears: is Doctor Doom worthy of leading this Battle World? Doom remarks at one point “the troubles of gods are infinite and beyond man’s understanding…but it wouldn’t take a god to divine that.” He also says “I am a poor god. I think now that once having made the world, I should have removed myself. Perhaps the gods of old had it right.” Dooms comments on becoming a god delve into ideas on omnipotence. What it means to create and control all things in the world. Doom wonders if he should withdraw from the world. Susan Storm urges him to keep in contact with the people he governs. The ideas that play out here: gods should interact with the people they govern. Gods are both beyond human understanding, but humans can still figure out their motivations, which are not that different from human wants and needs. The large question that Secret Wars points to, in regards to Doctor Doom here, is are gods that different from humans in terms of motivation, thoughts, and wants? Despite this, the reaction of the Marvel Universe survivors – Spider-man, Thor, Captain Marvel, Black Panther, and Reed Richards, for example – indicates that a man like Doctor Doom, omnipotent, and in control and being a god won’t be sustainable for long. Secret Wars #3 is published by Marvel Comics ($3.99USD) Jonathan Hickman (w.) Esad Ribic (a.) Ive Svorcina (c.) Chris Eliopoulos (l.). Cover artwork by Alex Ross. Artwork that uses effective colour and perspective. Themes of isolation that bring out a statement: making small connections to combat a sense of isolation and disconnection. Colour, Forced Perspective, and distinct posture add to the high standard of artwork. Silk’s battle against Dragon Claw is enhanced by these art choices. Her posture at work, and other moments in the art, separate her from the other characters. are covered in grey colours. Aerial fights between Silk and Dragon Claw have Bright orange, yellow, and blue colour filling the backgrounds. Forced perspective set up in Silk’s battle with Dragon Claw early in the comic book is effective, separating certain actions from the rest of the battle movement. track to everyone else around her. In a flashback featuring her now lost family, Cindy Moon is highlighted in red, while the other characters where drab colours. At work, her colleagues all have very distinct posture – slightly hunched shoulders, head down, frowning expression – as they read information on tablets and smart phones. They do not look up to speak to each other. Cindy Moon looks up, and makes eye contact when she speaks. Silk’s current story does have many significant ties back to Spider-man’s, which can make the Silk #1 confusing. Clear motivation, exploring isolation and attempting to be more social, appear strongly in this introduction. Spider-man’s advice is not particularly useful since he does not give Silk anything she can practice or try out to improver her situation. has gone missing, and she needs Jameson’s media network to find her family. To understand Silk’s story, there are many threads that stem from Amazing Spider-man and Spider Verse needed to see Silk’s motivation clearly. Knowing or not knowing Silks back story either makes this comic clear – understanding the full impact of Spider-Verse – or confusing at times. begins searching for her family while reflecting on who made the bunker, what resources they used to keep her there, how it was done, and why. Momentum for her own development begins here. Previously, however, Silk had a normal life. From her point for view, “normal” was fighting with her parents, struggling with schoolwork, hanging out with her partner Hector, and playing hockey. Now after being locked away from the world, she’s fighting villains, and weaving new clothes out of silk threads she can fire from her fingertips. It makes sense she is handling the clashing experiences of silent bunker and loud New York with only small success. Spiderman appears briefly. His advice on balancing strange spider sense powers with day to day life is not particularly useful: “give it time” is not anything that someone can work on or practice to improve on their difficult situation. The isolation theme built up gives way to a statement: moving forward from isolation is about making small connections around you to combat the sense of being separated. Isolation is the main problem that Silk fights against, however. Struggling with change and being social, she makes several key decisions to isolate herself from others. It’s interesting that there are several Pokemon references, since it is a game about making connections through trading with other players worldwide (not just about collecting). Cindy makes several comments that the villain Dragon Claw sounds like a Pokemon (it’s an attack that Dragon Pokemon can learn). She also has the pink singing Pokemon Jigglypuff on her desk at work. The theme of isolation builds up in the artwork, and in Cindy’s behaviour – running from her roommates, and from Spider-man. But she starts to put down new connections when she wins J Jonah Jameson’s trust with her analog, pen and paper approach to her work. Her search for her family introduces an opportunity. A good step toward re-connecting after isolation and loss. That’s the statement made by the theme of isolation. Moving forward by building small connections around you to combat isolation. 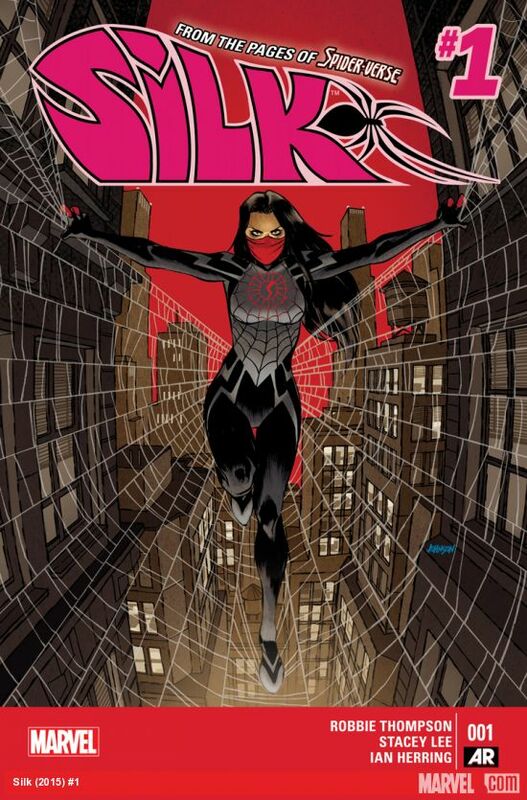 Silk #1 is published by Marvel Comics ($3.99 USD). Robbie Thompson (W.) Stacey Lee (A.) Ian Herring (C.) VC’s Travis Lanham (L.). Cover artwork by Dave Johnson. Themes of slavery and silence introduced through the villains. High science fiction: Spider-man as the centre of a character web that spans infinite parallel worlds. The artwork embraces scale, with several select splash pages. These pages are balanced with comedic moments. Colour and inking is powerful. In the opening pages of this comic, and once again halfway through, splash pages that capture motion and scale appear. Across the panels, a Spider-man from a distant, parallel reality swings through New York. In another scene, Peter Parker of the mainstream Marvel Universe also swings between buildings alongside new character Silk – Cindy Moon. Colour and ink in theses pages are powerful. Balancing these scenes, the artwork embraces comedy. A spider-man called “Peter Porker” (a human pig) Knocks out a villain’s peon. His punch produces stars, while the lettering reads “Ker Smak!”. Light and dark are also balanced. A scene where multiple spider heroes from a vast array of parallel universes appear in dazzling bright light arrives moments before a dark, rain drenched graveyard. Here, young Spider-man Miles Morales (Marvel’s Ultimate Universe) visits the grave of his deceased mother. It’s a one of several key moments in the comic’s story that points out how each character has their own unique story. They have people they love, the loved ones they have lost, or the places they live. Individual characters from several different parallel worlds live their own diverse and deep lives. The comic draws story threads from across Spider-man history to build up the credibility. The approach brought to characters in this large scale comic book story arc presents each version of Spider-man or Spider-woman as an interesting character. Rather than disposable copies of the mainstream Marvel Universe Peter Parker, these characters have their own lives. Efforts are made to establish them as unique. To create the sensation of well-rounded lives, the comic pulls together threads from Marvel’s extensive Spider-Man history, both older and recent. Gwen Stacey, for example, returns as the Spider-Woman of Earth 65. Another example is the Cosmic Spider-Man. A key moment from Spider-man history: Peter Parker once received, but ultimately gave up, god-like powers from the “Enigma Force”. This version of Spider-Man retained these abilities. The Inheritors, villains of the comic, show off themes of slavery and silence. References to threads, skeins, and looms also appear throughout the comic, which associates a spider’s ability to spin thread with storytelling. Through the villains – the arrogant, aristocratic Inheritors – themes of slavery and silence emerge. They have humans enslaved as their pets. They regard Spider-men and Spider-women as food. They tell several characters that they are not allowed to speak in their presence. Threads, skeins, and looming also appear repeatedly throughout the comic. The phrase “to spin a tale” is relevant here. Spiders spin threads. The idea of a thread as a way to describe linear storytelling ties together spiders with storytelling. An example of this storytelling theme is the god Anansi: a storyteller who takes the form of a spider. Spider-man appearing at the centre of a web of interwoven but different stories makes sense from this perspective. Peter Parker’s life is tied to each of these diverse characters. If there is a bigger theme emerging here, the complete story would reveal it. The first issues establishes Peter Parker from the mainstream Marvel Universe as the centre of a vast web that spreads out to encompass infinite parallel universes. It’s a high-science fiction concept. 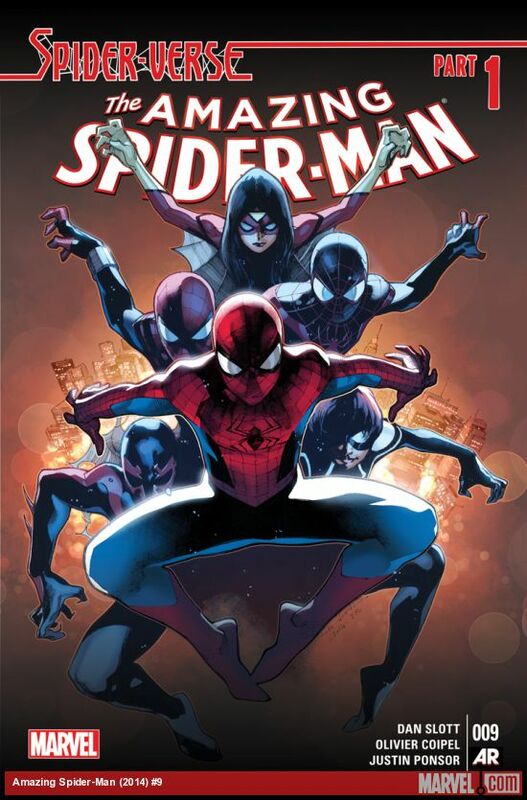 The Amazing Spider-man #9 is published by Marvel Comics ($4.99 USD). Dan Slott (W.) Olivier Coipel (P.) Justin Ponsor (C.) Chris Eliopoulos (L.) Cover Artwork by Olivier Coipel. While I’m on vacation for three weeks, I’ve put together a short round up of comics published this week. I’ll return to full reviews on October 11, 2014. 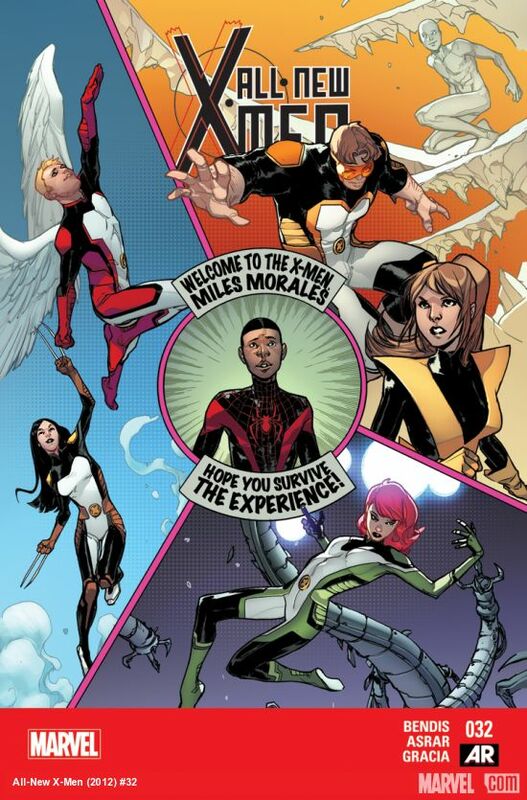 The young, time-travelling X-men are scattered across the planet after almost rescuing a new mutant with the ability to create portals between parallel worlds. A grand tour of various locations in the Marvel Universe, the artwork in this issue captures vibrancy, colour, and danger. Latveria, The Savage Land, and New York appear. Also appearing is the gloomy domain of the Mole Man’s underground kingdom. Jean Grey and Miles Morales share a deep conversation – dialog where two super-powered characters catch up on the defining moments in their careers so far is expertly written. There’s more than one cliffhanger here – it may take several issues to resolve this plotline. Every 90 years, 12 gods from across the world’s pantheon’s reincarnate as 12 teens. Not everyone believes this story, however. One of them – claiming to be Lucifer – is arrested and imprisoned for murder. And Laura – a god-fan and amateur detective – investigates. Introducing the home of several gods, Laura marches through wide, blue marble corridors alongside a powerful sky god called Baal – his character design favors gold chains and burnt orange suits with two buttons, which show the gods make interesting fashion choices. Large powerful images of fire and water appear later in the comic, establishing an elemental theme. Lightening is also referenced. Through body language and dialog, the god’s power is clearly underlined. A final conversation between Laura and Lucifer effectively shows moments of deception and power, revealing that this is a mature, and complex comic book. Doc Fate, The Atom, Abin Sur, The Black Hawks, and a refined and still immortal Vandal Savage form a new team of super heroes on one of the fifty two parallel universes that exist in DC comics. This golden age planet Earth, numbered Earth 40 – with technology, fashion, and popular culture references from the 1940’s and 1950’s – is under attack from invaders. A less refined and dangerous Vandal Savage is travelling across the multiverse, invading different Earths as he sees fit. The comic book delves into themes about the costs of war and violence. The Atom reflects about the costs of using his Iron Monroe technique, the “Atomic Fist”, to kill the monster Blockbuster – he has crossed his principals at great cost. Artwork choices show clear and strong character design. Monsters in particular look fearsome. A skeletal Parallax torments the Atom and fights Abin Sur. This comic book is one part in a segment of a larger story arc, which when fitted together, would show off characters and super heroes from across the previous seven decades. 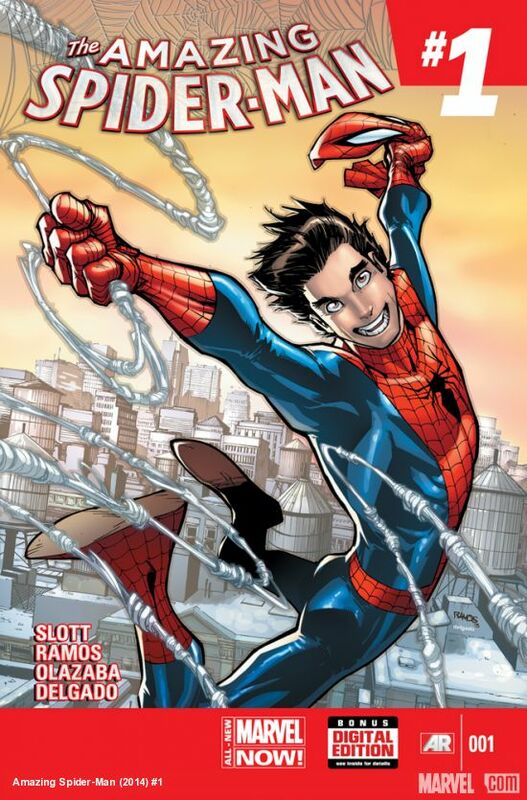 In a comic book filled with several stories, Peter Parker makes a bright and brash return to the Marvel Universe. Artwork that makes use of perspective – close and long distance artwork – and builds tension across panels. Humor and Banter between characters makes the comic entertaining. Rated T for teen readers, some of the content is not suitable for younger readers, with Spider-man‘s costume dissolved and medium violence. This Review covers the story “Lucky to be Alive”, which is the first, and longest, of the Spider-man stories within the comic book. Art found on the first page recaptures the art of the 1960’s Spider-man comics. Scenes are recreated in detail and cast in a warm, gold light. It’s a tone that implies good memories of times gone by. Later, as the artwork shifts to the present day, where plot threads are picked up: Scenes that move rapidly from close up perspectives to long range capture the debris leftover from Superior Spider-Man’s conclusion. It’s a bit bewildering early on. Close ups build tension and capture movement across panels, however. Clear artwork with great use of full page work make these transitions flow with ease. Peter’s body shape seems to be rendered in a different size and shape compared to earlier stories. There’s something older about his face also. The war of minds between Parker and Otto Octavius has taxed Spider-Man’s health. The pencil work, and inking depict an older and slightly thinner man. Readers looking for answers (how did Peter return? What about the Avengers?) might find the large scale text difficult to read through. The comic opens with a calm tone, however. Answers unfold slowly. Marvel comics deftly weaves a new thread into the Spider-man myth: another person received a radioactive spider bite from the same spider that bit Parker. She wears an ankle bracelet with a tiny, green crescent moon attached. One Page in this comic is devoted to J. Jonah Jameson. It’s like a miniature, one page version of J. Jonah Jameson’s own comic. The character is large and loud enough that this page feels like a miniature comic of its own. The humor and smart remarks between characters in this issue is first class. Banter between villains White Rabbit and the villain formerly know as Gypsy Moth – now called “Skein” – is excellent. They argue over the need for a ‘motif’: an animal theme in this case. One hard fact remains. After Otto Octavius finished being a Superior Spider-man, his reputation as a friendly hero was warped into a dictatorial commander complete with thugs and giant stomping robots. A large theme of returning to life – resurrection – appears. Spider-man’s costume damage is a plot point, and represents his tarnished reputation. There’s a theme of returning to life – Peter’s return is somewhat of a resurrection. White Rabbit’s appearance prompts one character to make an Easter reference. Since Easter is a festival that celebrates renewed life, it makes sense to add this theme to Peter Parker’s return. Spider-man’s loss of costume raises several points: The damaged suit, unraveled, makes a point of Peter’s damaged reputation and identity. No costume emphasises Spider-Man’s vulnerability. He’s emerged into a dangerous new world. His disrobing also plays into the plot effectively. Spider Woman sees footage of “Skein” attacking Peter on a live television feed. She believes that Spider-man has run into such bad luck for this to happen, that there is no way he is a dictator or commander any longer. The plot point also reveals a closer relationship with Anna Maria Marconi – a science student Otto Octavius dated while in control of Spider-man’s body. Marconi recognises Peter is Spider-man when she spots freckles on his stomach normally concealed by the red and blue costume. A popular culture reference: A passerby on the street references Miley Cyrus when Spider-Man’s costume is destroyed by the “Skein”. She compares Spider-Man to Miley Cyrus from her “Wrecking Ball” music video. The Amazing Spider-man #1 is published by Marvel Comics ($5.99 USD). Dan Slott (W.) Humberto Ramos (P.) Victor Olazaba (I.) Edgar Delgado (C.) Chris Eliopoulos (L.) Cover Artwork by Humberto Ramos. Superior Spider-man #30 reaches the summit of a long running story arc. Peter Parker’s character is depicted from a new point of view. I’ve written before about Superior Spider-Man. First in a review of issue #18, and later again on issue #26. If you are not up to date on the current plot, the opening paragraph of the second review has a summary of the current problems facing Spider-man. Artwork depicting milestones in Spider-man history. Consistent use of broken bonds builds themes of breaking out, and escape. A major turning point in the Superior Spider-man story arc. A large splash page shows off a turning point – Parker reclaims all his lost memories – in addition to artwork milestones from decades past. A great moment for the comic book art occurs at the halfway point. I mentioned previously that Peter Parker forced his way out of a trap set by Otto Octavius (The villain Doctor Octopus – think mechanical arms and goggles). A two page splash page shows off Peter in his blue and red costume. He remembers who he is. All his lost and scattered memories back in order. Pencils, inks, and colours mesh together. A web patter fills the background. The web creates a grid. within each cell of the grid, is a reprint of past artwork. Artwork that has defined Spider-man comic books spanning past decades receives acknowledgement. In a place called “The Mindscape” Parker overcomes the last fragments of a trap. Otto Octavius expresses some startling and new insights. The Avengers also appear briefly. Despite his arrogance and bluster, Otto Octavius takes a huge step in an unexpected direction. What’s unusual, I thought, was an arch villain in popular culture admitting that they have failed to achieve their plans, without moving blame to a meddlesome hero. The comic book investigates Peter Parker’s character. I mentioned that Peter Parker struggles to regain control of his body. These struggles of the mind take place inside “The Mindscape”. A quiet, green coloured place that represents the mind currently shared by Peter Parker and Otto Octavius. Here, Parker relieves the brutal and violent memories of Doctor Octopus. A trap where the memories replay in loops, with Parker in the starring role. When Parker finally frees himself from the last bonds of this trap, the deeper investigation into his character begins. Otto makes more admissions. He is arrogant because he knows about his flaws. Low self esteem leads to over compensation. Parker’s talents, his intelligence and skills, combined with his bravery, receives some attention. This is a step in a new direction: traditionally, Spider-man comics focus on what Parker fails to achieve, rather than his potential, and his strengths. Marvels’s Avengers return for a few pages. The harsh judgment on Captain America’s face speaks about the approaching consequences the Superior Spider-man will face when this fight is over. That is, if he can defeat the Green Goblin. And the army of Goblin soldiers and anarchists. Breaking ties, or things unraveling appear repeatedly throughout this comic. Ropes and webs fray. Wires, machines, and even aggreements made between people are torn up and thrown out. This unraveling repeatedly lays down a larger theme: Breaking bonds and broken ties. Unfortunately, New York itself slides toward chaos. Fires burn, and goblins storm the city. Rules of law and order that kept the streets relatively free of violence and danger are broken and burned away. Alongside the city breaking down, characters within the city express comments about breaking or destroying things consistently throughout the issue. The Spider-man of 2099 breaks down a fleet of robots by targeting their weak points. Liz Allen severs all ties with New York Mayor, J. Jonah Jameson. A young girl named Amy Chen is freed from ropes that bind her. Breaking out of bonds consistently reappears. And for good reason. Superior Spider-man #30 offers readers a big, Spider-man event. Without plot spoilers, themes building for several issues pay-off here. A popular culture reference appears early in the comic when the Green Goblin imitates the scene from The Wizard of OZ where The Witch of the West taunts Dorothy with an image of Auntie Em in her crystal globe. 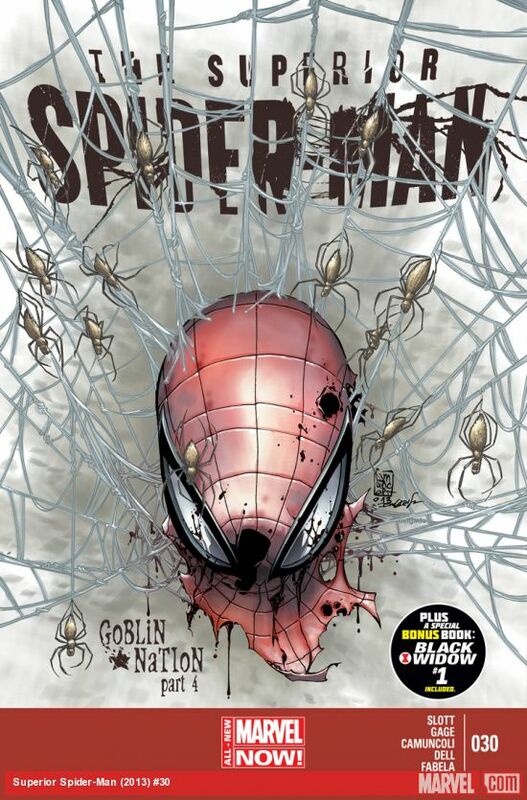 Superior Spider-man #30 is published by Marvel Comics ($3.99 USD). Dan Slott & Christos Gage(W.) Giuseppe Camuncoli (P.) john Dell & Terry Pallot (I.) Antonio Fabela (C.) Chris Eliopoulos (L.) Cover Artwork by Giuseppe Camuncoli.